Star Wars Rebels is returning from its mid-season break with an appearance by another legacy character. 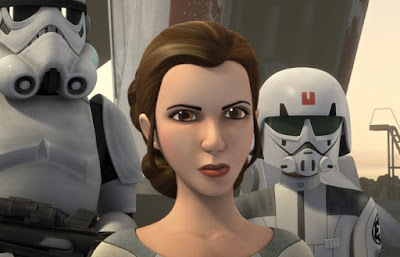 TV Insider broke the news today that Princess Leia would be making her small screen debut on Rebels when the show returns on January 20th with the episode "A Princess on Lothal". Leia will be voiced by Julie Dolan, who also provided Leia's voice for the mobile game Star Wars: Uprising. Star Wars Rebels returns on January 20th in a new timeslot, 9pm (half an hour earlier that during the first half of the season), with "A Princess on Lothal" on Disney XD! You can watch a preview clip from the episode here. Great! I hope we see a lot of her. I've always thought "Rebels" really ought to star Leia. I've tried soooo hard to watch Rebels, but I think I've given up for good. A bit too "kiddie" for me. I'll wait to read episode synopses from here on out. While I am excited to see Leia and I think they did a wonderful job capturing the likeness of Carrie Fisher in the style of Rebels, she seems a tad too old looking for the time period. She looks as she did in the original trilogy. Remember, Leia's only a few days younger than Ezra (Ezra was born the same day that Palpatine declared himself Emperor, with Luke and Leia being born shortly after) and Ezra's 15. They should have made her seem a little bit younger, but it is a minor nitpick.